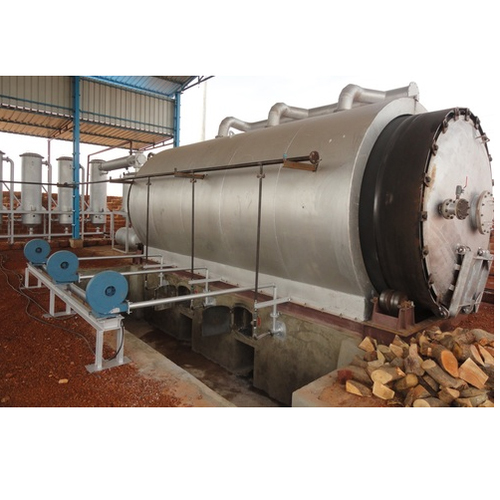 Waste Tyre to Oil Plant involves the process of pyrolysis that is meant to convert useless tyres into industrial fuels like fuel oil, carbon black, steel wire and hydrocarbon gas. 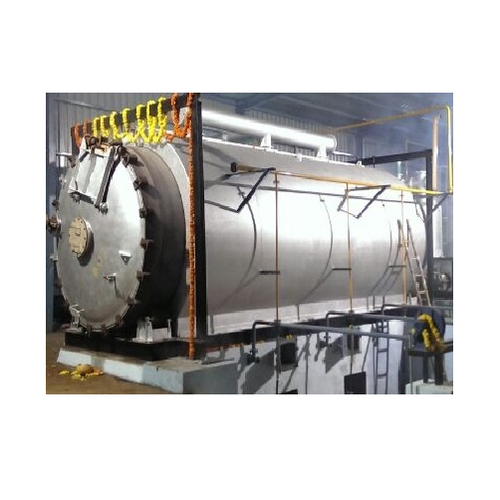 The method of pyrolysis is defined as a chemical reaction that includes the breakdown of large molecules into smaller one in attendance of heat. The temperature of about 400 to 450 degrees in maintained and there is no oxygen supply for the occurrence of pyrolysis and burning of the tyre start. The recycling of the tyres leads into formation of oil, carbon black, steel wire and natural gas. Different oil ratio is available after the process that is used in several industries for performing various applications. Our presented range of Tyre Oil Plant is described as a technologically improved product that engrosses the process of pyrolysis. 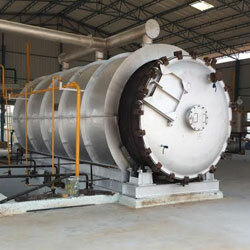 The plant includes the thermal decomposition process that includes burning of organic materials at a prominent temperature in absence of oxygen. This involves the change in both chemical and physical phase, resulting in formation of fuel oil, carbon black, steel wire and natural gas. Our skilled make use of the genuine grade of raw materials for the fabrication purpose in combination with high end technology and most updated machines, making it resistant against rust and weather conditions. The available plant is appreciated among our customers for its unmatched characteristics like reliable performance, strong structure, dimensional accuracy and excellent durability. Instilled with the sophisticated machines and advanced technology, our firm is acknowledged for offering Waste Tyre Recycling Plant for our clients. The pyrolysis technology is practiced for the recycling of 100% waste tyre and turns them into highly usable products like fuel oil, steel wire, carbon black and natural gas. 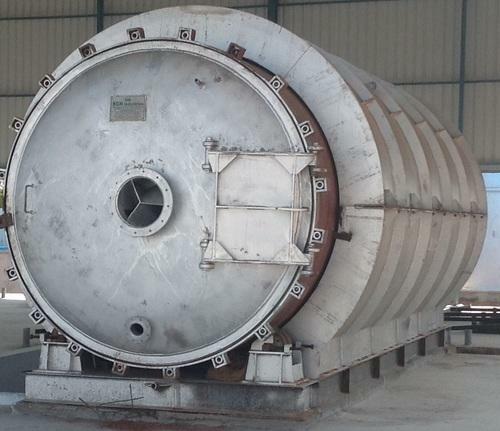 The pyrolysis process does not leave any kind of wastage behind and no chemical is used for the same making it environment friendly. After the completion of the process, there is no soil, air or water pollution; thus making the resultant product highly valuable. Therefore, this plant has become highly demanded in the market due to its unparalleled characteristics like easy operation, pollution free operation, efficient performance and cost effective functioning. Therefore, this plant has become an ideal substitution for different source of energy like petroleum and natural gas. Waste Tyre Plant is engrossed with modern machines that follow the pyrolysis method of recycling that make use of waste or shredded tyres. These tyres are put into the reactor to get softened after that continuous breakdown of rubber polymers occurs into smaller molecules. These smaller molecules get vaporized eventually and leave from the reactor. Moreover, these vapors can further burned to generate power, oil, gas, steel wire and other important byproducts. The process is a very clean method where there is no production of wastage and pollution. The steel wire which is formed during the manufacturing get removes from the solid stream with magnets. The purest quality of the oil that is formed becomes a suitable substitution of industrial diesel, natural gas and petroleum. Fully Automatic Waste Tyre Pyrolysis Plant (10 Tonnes) is a unique way to make use of renewable technology adopted by many industries for recycling the waste. This involves the use of waste tyres that act as a raw material and produce by-products like carbon black, steel, gas and green fuel oil. The plant has become an environment-friendly and can change the market scenario in innovative ways. The process of chemical decomposition occurs in the absence of oxygen at an optimum temperature required for the process. With the advanced technology, this plant consumes less energy and enhances the production. The offered range is manufactured using the highest grade of components that work in compliance with international standards that offer high reliability and durability.